For pencil horse drawings the easiest way to get started is to use shapes and lines that are easy to make. They will block out the basic shape. If you just joined in, you may want to review the overview page first by scrolling down and going back to the beginning. It will give you an idea of the steps you'll take to complete your creation. If you just want to jump right in, grab your pencil! You're in you're in the right spot! (iv) Now you will make one more slightly larger circle that intersects the top circle like in the picture. 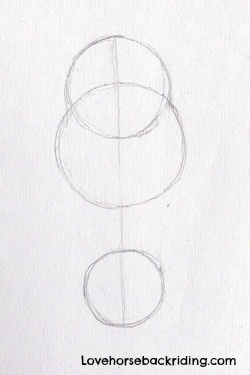 Remember for drawings at this stage, your goal is to get the basic proportions and shapes down on paper first. Keep all the shapes in this step of the pencil drawing very light. I have darkened them so you can see them on your screen. You will erase most of them later. Leave pencil horse drawings to reveal other pieces of great equine related information through the home page.